This is just a quick post to note down something that I have been explaining to people lately. The project I am working on at the moment has several teams of developers working together and most of the code is being cut in Visual Studio 2008 / .Net 3.5. As such, we in the BizTalk feature team are taking delivery of components coded in other teams and integrating them. 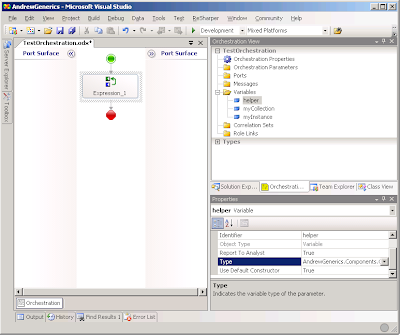 We are using BizTalk 2006 R2 and developing the BizTalk orchestrations in Visual Studio 2005, although there are no compatability issues between the binaries developed in 2008 and 2005, and anyway generic types were introduced in 2005 / .Net 2.0. However, where I have come across an issue is in the use of generic types, and specifically assigning generic types to orchestration variables. In some cases orchestrations and expression shapes support generics and in some cases they do not. All I am going to do is to illustrate some cases where generics are OK and some where they are not, with a bit of explanation as to why. If you do this, you can reference "MyClassCollection" as a variable in your orchestration and everything will be fine. Note that the usual rules about classes being marked as serializable apply. All those errors are because of a couple of things, but mainly because when you add a variable to an orchestration, or add code in an expression shape, the designer writes some C# code for you and then compiles it. Because the way that the designer handles generics is incorrect the C# doesn't compile and you get the build errors. Therefore, even though the method in a helper component has a generic type in the code, when the class is compiled the generic type gets "baked" into the interface and so the variable assignment works. Now let's add another method onto the helper class that we can use to receive a collection of objects, but again through a generic type. Again, this is handled OK by the BizTalk compiler when we are assigning to our collection and the we are casting the type of the result. For the same reasons as above, we can't create a variable of IEnumerable<MyClass;> so we can't receive the output of this method without casting it, but we can at least handle it. Obviously, if at runtime we were presented with a different object that conformed to IEnumerable<MyClass;> (such as an array) we would get a runtime error because of an invalid cast. However, we have been able to declare a method that uses a generic type, and for the same reason we can use it, i.e. when the helper component is compiled the method signature becomes fixed and the orchestration compiler can handle the output. 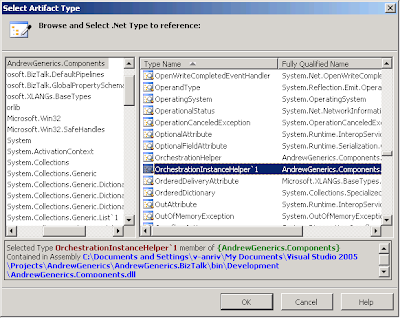 You cannot declare generic type in an orchestration because you can only select types in the type picker. If you select a generic interface that does not have the type assigned you get some crazy errors. In order to use a generic type you can create a class that implements the generic type. This will then be usable by BizTalk. When a helper component uses generic types in the interface the types get baked into the interface and can be used by BizTalk. Nice one Andrew. A little "pattlet" for using Generics with orchestrations. Also nice that the project has got you blogging again.